These are bath fans which also have a heater incorporated into their housing. These are bath fans which also have a light incorporated into their housing. 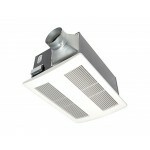 Selecting the proper bathroom fan for your application is important to maximize the lifespan of the fan and parts. Deciding which manufacturer to purchase from is important. 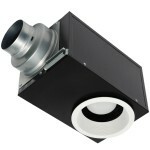 Often times, bathroom manufacturers use different quality parts based on the given price point. Economy grade fans may use less durable parts and may have a slightly shorter lifespan. Whereas, higher end models typically are quieter, last longer, and have more power. The CFM rating refers to cubic feet per minute. This is the volume of air that is moved by the fan during a 60 second period. 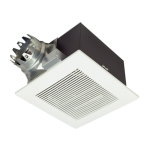 The CFM rating is important in case you are installing the fan in an area requiring proper ventilation such as a bathroom or kitchen to avoid moisture build and bathroom mold. 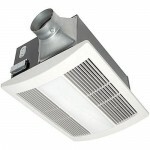 Bathroom fans that have a higher CFM rating will be able to remove steam and moisture much faster than less powerful fans. 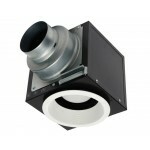 For small areas such as single bathrooms, a 50-100 CFM fan will suffice, however, for kitchen applications or large bathrooms, or steam rooms, higher power models are recommended. 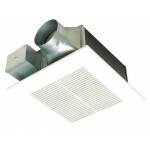 At Westside Wholesale, we sell many types of bathroom fans based on your preference and need. 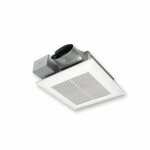 Combination bathroom fans include features such as night light, heaters, and humidity sensors depending on your needs. 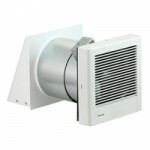 Bathroom fans come in several ratings of noise level from Standard to Super Quiet. The output noise level is rated in Sones, to give a accurate measure of what to expect from your fan. Super Quiet bath fans can reach a Sone level as little as <0.3 Sones. At this level, the fan is virtually silent and produces less than 1/3rd the noise of a running refrigerator. The Sone level has a direct impact on the price point of the fan, meaning that less expensive fans typically generate more noise. If your application is a retrofit, than it is important to make sure the dimensions of the fan you select match the dimensions of the fan to be replaced to reduce rough in time and effort. It is also important to know if the fan is hardwired or if it has a standard outlet plug. 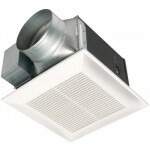 Most bath fans use a 4” duct to output the air from the fan. 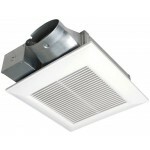 If you are replacing a bathroom fan, you will want to check the exiting duct size that is being used by your ventilation system to reduce further modifications. If your exiting duct size is limiting the amount of air flow through your system, you may consider using a larger diameter duct to reduce air pressure in your system. 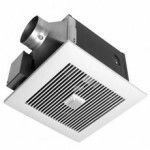 Panasonic® bathroom fans help protect a building or home by removing potentially harmful pollutants and excessive moisture from your living environment. Maintaining a healthy indoor air quality in your residence or commercial building is obtained by proper ventilation. 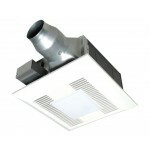 Westside Wholesale offers the best bathroom ventilation solutions that will fit the needs of every customer and its house. 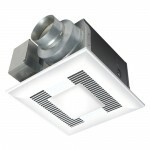 Our Panasonic Bathroom Collection provides customers with wide selection of Panasonic bathroom fans and accessories to not only create but correct the ventilation system in any building. 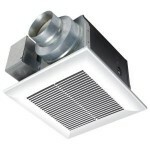 Installing Panasonic Bathroom Fans in the house brings numerous benefits for the room and residents. 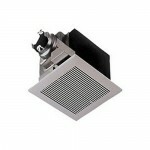 First of all, such device provides proper air circulation thus ensuring healthy and clean environment. Secondly, Panasonic Bathroom Fans offered at Westside Wholesale prevent breeding of germs and bacteria that appear in moist and unhygienic environments. 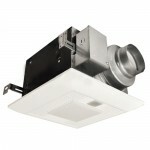 At last, bathroom fans prolong the life of walls and household appliances by removing excessive moisture from the room. Apart from the benefits listed above, Panasonic Bathroom Fans may become an appealing addition to any bathroom's décor bringing elegant and refined details to the room's appearance. Shop our wide collection of Panasonic Bathroom Fans presented at Westside Wholesale allows selecting a perfect option for your bathroom. 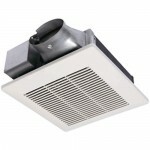 A Panasonic Bathroom Fans comes in various models including heater fans with light, motion and humidity sensors, low profile design, continuous or ceiling fans mounted fans for 4", 6" or 8" diameter duct and many other models. Such wide selection of Panasonic bathroom fans lets every customer select the perfect option for his or her indoor ventilation needs. Panasonic bathroom fans offered at Westside Wholesale combine low energy consumption with quiet operation and long service life. Each device is equipped with a highly efficient motor that allows you to save money on energy bills. In addition, Panasonic Bathroom Fans offer easy and quick installation and can be mounted vertically or horizontally depending on the room's conditions.